Shane Shirley : Turn Your Trash Into Cash! Whoever had this bright idea is a genius! I have already taken tons of cardboard and phone books to the one at my daughter's school and it felt great. Plus, my daughters are learning that a little bit of effort can literally pay off. 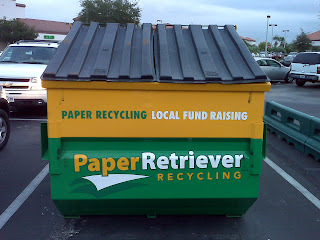 Check out their site for more information or to find a Paper Retriever bin in your area. 1-12-10: Just a note. No cardboard is allowed in the bins...oops! 8-23-11: I tried to contact Paper Retriever by sending them an email in their contact form and after two weeks, never received a response. The recycling coordinator for our school district, suggested I contact S P Newsprint for a bin and I have been very pleased!! Hi Spamelot! Please leave only thoughtful comments or questions that contribute to the environment, health and wellness. In my country, so many people life from trash. They picking the botles, cans, etc. They sold them to the "trashlord" The trashlord become richer everyday and the picker stay the same. Thats bad! Yes, AB, that is bad. I am sorry your country has these things. Every country has challenges including the US...obviously. This company is a great way to help out though. Having been in that position I completely agree with the wise man's words. I think it all comes down to the character of the individual facing the situation. Strong folks who embrace the reality of their situation and bear down, while weak people will throw their hands in the air, determine it was never meant to be, and just give up.